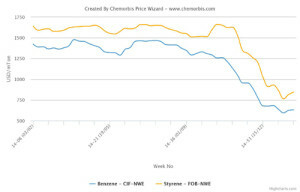 In Europe, the PS market continued with its decreasing trend during last week as per the pricing service of ChemOrbis. However, the decrease amounts were smaller compared to those in July since the August styrene contracts settled with a relatively smaller decrease of €25/ton, when compared with last month, when styrene contracts had settled with a larger drop of €85/ton. 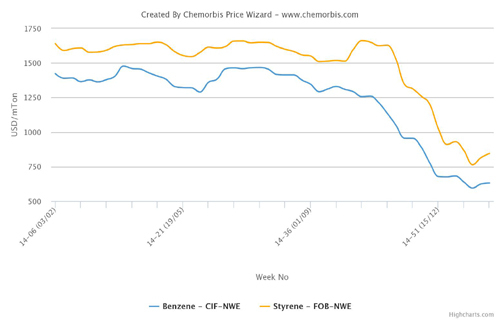 Apart from styrene, August benzene contracts settled with €13/ton decreases while the butadiene contract settled at a rollover from July levels. Following these relatively smaller upstream decreases, a West European PS producer announced a €10/ton decrease on their August gentlemen’s agreements. However, buyers expect to achieve the entire styrene contract drop of €25/ton on their gentlemen’s agreements. In production news, Styrolution is planning a maintenance shutdown at their 475,000 tons/year PS plant, located in Belgium, in the second half of August. Versalis will shut one of their HIPS lines at Mantova, Italy in September for 15 days. The line has 280,000 tons/year capacity. Given the summer holidays in Europe, the shutdowns are not expected to have a big impact on supply levels as overall demand is expected to remain mute and players will be mostly away from their desks. Nevertheless, some buyers have already started to cover their needs for early September for when they come back to resume their operations. A converter operating in Italy noted that they committed to an import cargo for early September delivery since they will be out of the market for about three weeks. “Our end product demand is not good during this period,” he further added. According to ChemOrbis, a different converter also reported that they are placing inquiries with Asian suppliers for September delivery. “We anticipate mostly a steady trend for September,” he noted.